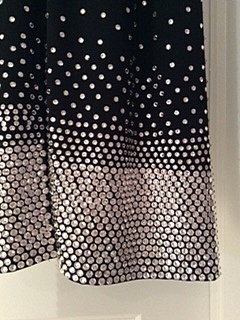 Description	 Black Dress is stunning on the floor, with thousands of Swarowski Crystals, SS30 and smaller - see close up picture. Comes with 2 stoned cuffs and a stoned belt, all in swarowski crystals. Will fit height 5'2"-5'8" and size US 0-2 or XS S. I can send more pics of detail if necessary.